« Never a dull moment! 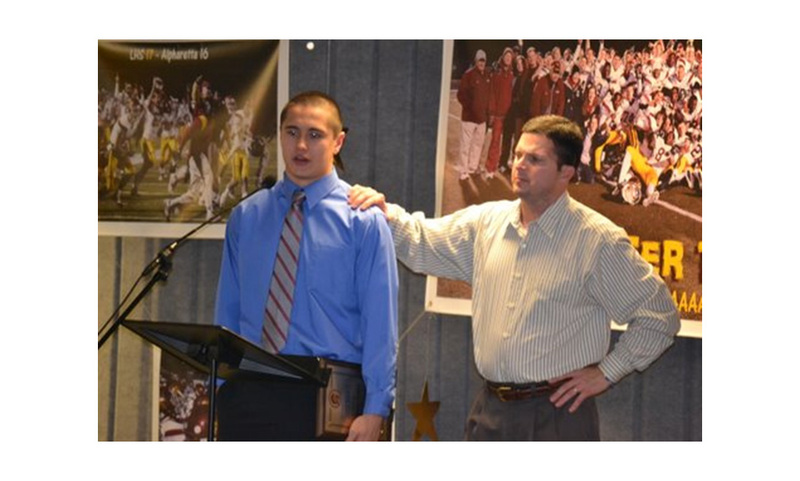 When the subject of the Football Banquet came up in December I remember thinking that seemed like an eternity away. In fact, I was pretty certain there would be someone representing the Fosters other than Greg. As the days ticked by and we moved into January, it seemed like a real possibility but I still was not convinced. The month of January has been wonderful in a lot of ways but has also shown a significant decline in Greg’s overall health. It’s still hard to recognize in total if you just spend a little time with him. Even just the week before I heard Greg’s dad say something about his doubt followed by a definitive “and just think you are going to be there”…. Quietly I was clinging to my reservations. This was a good time to be wrong. Thank you for giving me the chance to speak to you tonight and to present the courage award. I don’t always feel courageous but I do know where my courage comes from as faith is a huge part of our journey. It gives us the ability to stand before you tonight. I didn’t know what exactly I was going to say tonight until this morning when I read the devotional for today. Thank you for letting me share it with you. Give up the illusion that you deserve a problem free life. Part of you is still hungering for the resolution of all difficulties. This is false hope. You will have difficulty in this world. Link your hope not to problem solving in this life but to the promise of eternity. Instead of seeking perfection, pour your energy into your faith. It is possible to enjoy life in the midst of adverse circumstances. In fact, God’s light shines most brightly through believers who trust in the dark. This kind of trust is supernatural. Be less interested in finding the right circumstances and more interested in the right response to whatever comes your way. Afterwards we were able to give the first courage award to a very deserving, humble young man. We are grateful for the chance to honor him with all he has been through. 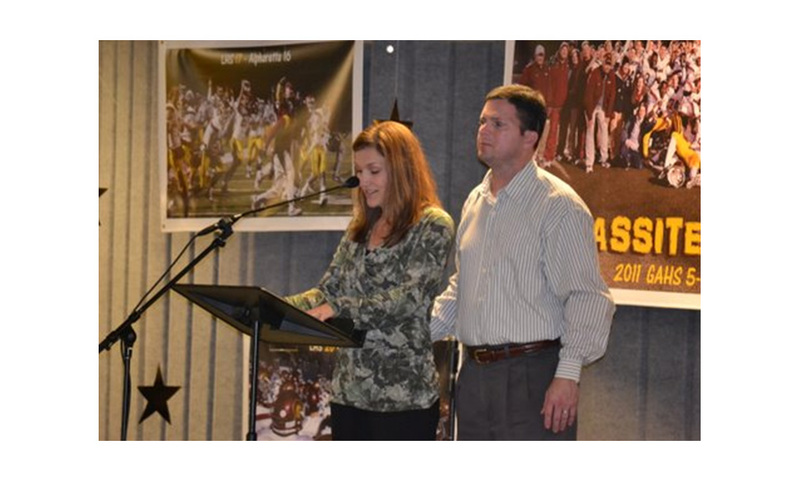 It has been a true gift meeting the collective “Lassiter Football Family” in the coaches, players, and parents. Thank God for football and another significant event in our year. I love it. How perfect. Those words were perfect!!! God’s light is clearly displayed through your life. Think of you and pray for you often. Awesome to read and see. Thank you for being open…more open than I could have ever been throughout this past year sharing. Your words and openness have changed our lives and allowed us to pray for you and your family with an understanding of what was going on at that time. I’m so glad Greg got to present this award as he has shown true courage this past year. It was great spending time with him last week at lunch and how thankful he was for his wife and all he had. Thanks for sharing Michelle. Ya’ll are in our prayers every day. You have touched many lives through this difficult time. Your faith, courage, and spirit is truly an inspiration. You are the most courageous person that i know! I understand that your strength for each day comes from your trust in our faithful God and loving Father. I thank Him for your testimony! We trust you Jesus and know that You are with us. It still amazes me how God continues to use you and Greg in so many ways. 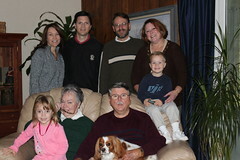 Praise the Lord for His grace, and for yet another wonderful opportunity for your family to be together again! Love you guys and continue to lift you up. It continues to touch me in your special blogs. You all are in my daily prayers. Read this blog along with others to Sharron Prough, she sends her thoughts and prayers.